Voltage sags, swells and interruptions are among the most common power quality events that affect the operation of electrical systems. 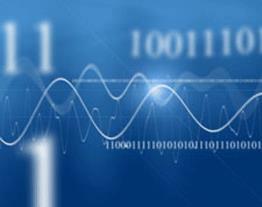 A detailed analysis of these events requires the use of a power quality analyzer. However, with the advanced performance of the SATEC power meters, such functionality can be achieved to some extent on a lower budget. SATEC 130 series of power meters, which includes the EM132, EM133, PM130 and PM135, offers basic power quality analysis. For power quality analysis, the EM133 or the EH model of the PM130/PM135 should be used. This allows harmonic monitoring (including individual harmonic, THD, TDD and K Factor), waveform monitoring, unbalance measurement, frequency deviations as well as voltage sags, swells and interruption detection. This application note describes how to detect sags, swells and interruption using the EM133/PM130EH PLUS/PM135 models. The detection of events is performed with the comprehensive set-points mechanism that is incorporated in all SATEC devices. This is a very powerful tool, allowing each power meter to perform various operations that are often performed by additional equipment, thus saving costs, space and installation. 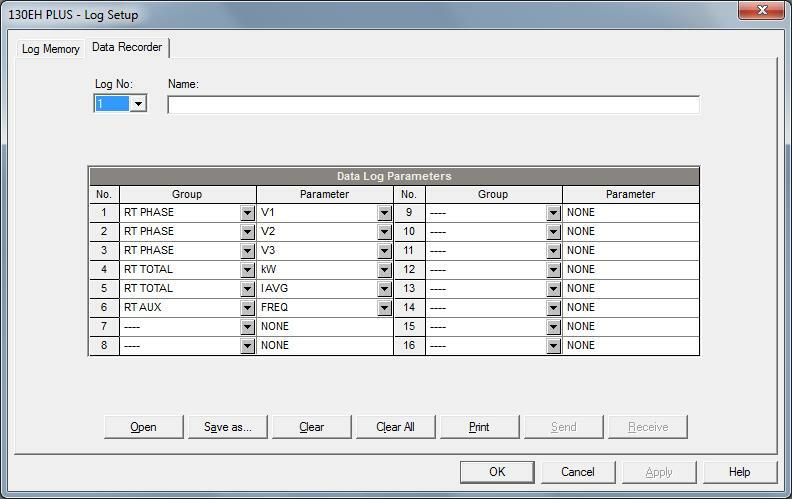 The operation of each set-point is data logging, which is programmed to log the three voltages (it is recommended to add currents for good analysis as well as other parameters, depending on the requirements, while considering the amount of parameters vs. memory size constraints). 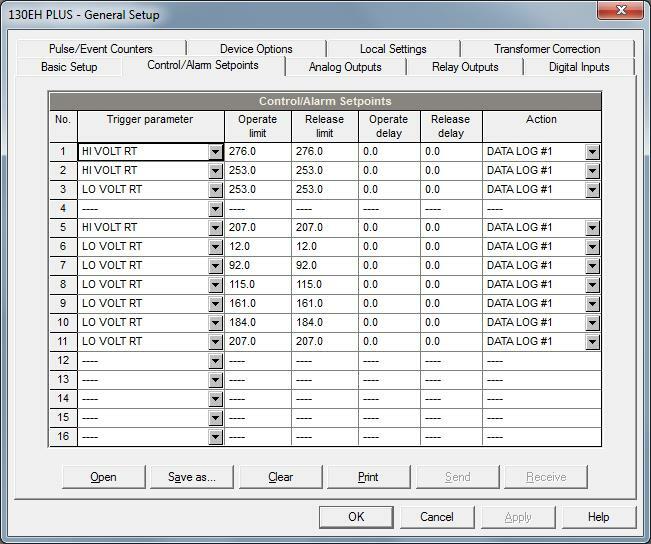 The result is a list of events and values of voltages with time stamps. Thanks to the 1 cycle measurement capability of the device, the time stamp resolution is 20ms. Since the events are logged during the beginning of the sag/swell/ interruption, the voltage values do not represent the most extreme value. However, the multiple set-points ensure that the sag/swell can be correctly classified. 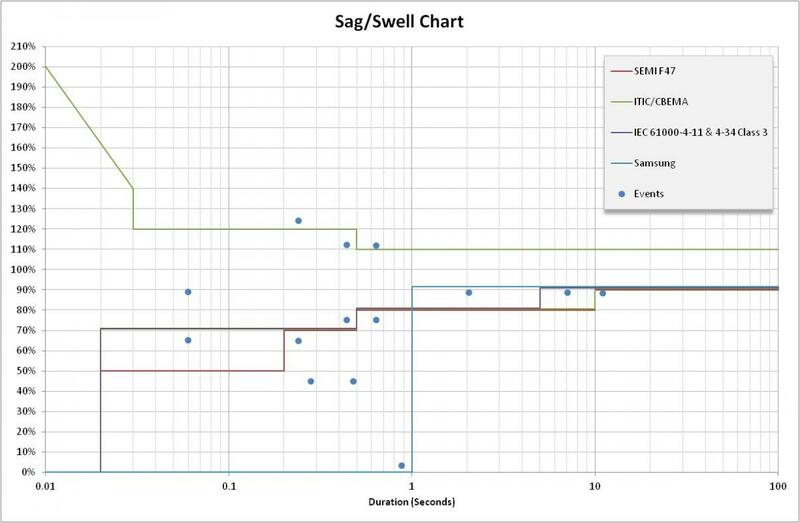 This is the major limitation of using these devices and care should be taken, especially when comparing to international sag/swell schemes such as CBEMA/ITI Curve. 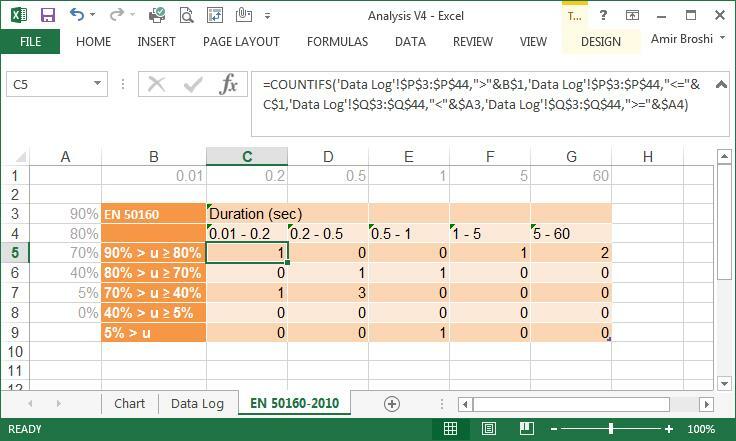 Using Excel standard functions, the time periods between events were measured (column P), the peak voltage in % was calculated (column Q) and the event type was identified based on the set-point ID (column R). 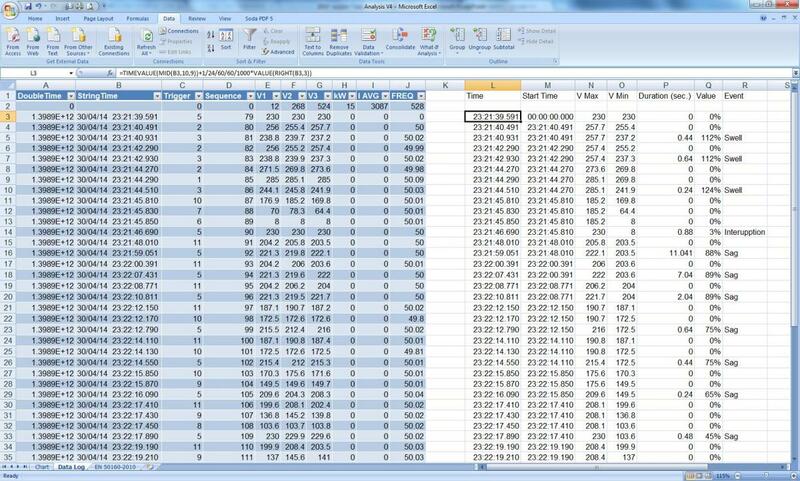 The results were classified according to EN50160 cells (Figure 4) and plotted using Excel standard XY scatter chart, together with the various sag/swell standards – CBEMA/ITIC, SEMI F47, IEC 61000-4-11, IEC 61000-4-34 and Samsung Power Vaccine (Figure 5). Table 1 compares the injected events to the detected ones by both the PM135 (tested unit) and the PM180 (a certified Class A Power Quality Analyzer) that were connected in parallel. The voltage level was changed during 40ms before and after the event and the "event net duration" column represents the duration in which it was flat at that level. Due to this, an addition 1 or 2 cycles (0.02-0.04s) is added before and after each event (total 0.04‑0.08s). The results are that the PM130EH PLUS (as well as the EM133 and PM135EH) can detect sags, swells and interruptions in one cycle resolution and sufficient voltage accuracy, as well as compare the information with international compliance charts. It cannot replace the dedicated power quality analyzer, which has ½ cycle resolution (according to standards) and accurate voltage levels (plus additional functionality such as waveform logging and voltage flickering), but it does provide reliable and cost effective detection of 1 cycle or higher events. Table 2 compares the Power Quality options of SATEC devices. In similar way, it is also possible to monitor voltage imbalance and frequency events, which together cover most of EN50160 type of events. Table 3 lists the various power quality events, the order of magnitude of its measurement (the period itself depends on the standard) and the possibility of detecting it with this technique. It is possible to detect power quality issues using power meters only, providing they have fast and large set-point capabilities. The method allows wide implementation for single loads and secondary MCCs. In primary MCCs, important secondary MCCs and sensitive sites, a Power Quality Analyzer is required.